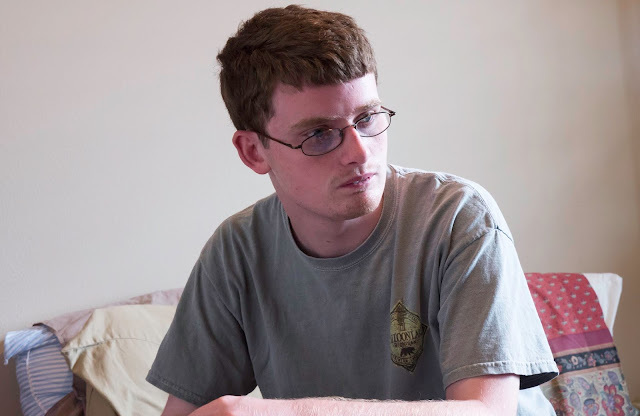 David James Savarese, known as DJ or Deej, has autism and doesn't speak. As a young child, he was placed in foster care. He was abused there, but couldn't tell anyone. Only after he was adopted by parents who taught him to read and write was he able to share his story, which is the focus of the film Deej, making its Canadian debut this Friday at Toronto's ReelAbilities Film Festival. "Imagine for a minute," DJ says with a voice device in the film, "that...you are removed from your home for reasons no one bothers to tell you because you can't speak, so they assume you can't hear or think or feel." And later: "To this day, I question my humanness." The film follows DJ through a regular high school and into college, revealing a rich world that he expresses in poetry and as a playwright. BLOOM: Why did you want to make this film? DJ Savarese: I wanted to show the people who said I was incompetent, that I’m not. I wanted to show people that they make wrong assumptions based on people’s appearances all the time. I wanted to show neurodiverse kids that they are needed and worthy of being celebrated. BLOOM: What technology and support people do you use to communicate? DJ Savarese: I can use almost any means to communicate: photos, AAC, manual sign language, writing, typing, and even my vocal cords. Because I still intermittently dissociate and lose track of my body, I travel with a support assistant whose physical resistance to my movement makes it easier to locate my hand—and body—in space. BLOOM: At one point in the film you say 'no assistive device can do' what your mom does. What do you mean? DJ Savarese: I mean that no assistive device can fill in when a paid support person is sick, or late, or quits, and all I need to do is look at her to remember I deserve respect, and I can handle it myself. BLOOM: Just to clarify, is the value of the support person (in addition to providing physical resistance) that he or she is a constant reminder that you're worthy of respect? Is it about the power of seeing yourself through the eyes of people who know you? DJ Savarese: Yes and yes! I love your notion of seeing myself reflected in the eyes of those who 'get' me—yes. BLOOM: We learn you suffered severe emotional trauma as a young child in foster care. You say that because you don’t speak, people 'assume you can’t hear or think or feel.' Why is speech associated with being human? DJ Savarese: I’m not sure. You’d have to ask a neurotypical [person] that question, I think. Maybe it’s because developmental tests make speech a gatekeeping skill that keeps some kids from ever getting the chance to be taught to read and write. BLOOM: You talk about a mission to “free your people.” Does this refer to non-speaking autistics, or all non-speaking people, or all people with disabilities? DJ Savarese: I want the film to speak for all nonspeaking people, and I tell my story so kids with trauma and kids in foster care can see life gets better. It might refer to any of those people, but it also refers to any of us who are not allowed to lead the life we want for ourselves because we are pigeonholed by society. BLOOM: Your film touched me deeply, because I have a young adult son who doesn’t speak (he doesn’t have autism, but a rare disorder). He is able to read, but he’s never developed a fluid form of communication so he can freely express his thoughts. What can we do to empower people like my son? DJ Savarese: Keep working with him to increase his fluid communication and explore a variety of ways to communicate. There are examples on Listen2Us of how to move someone who uses single words to sentences and from sentences to paragraphs. I’m sure no one stops learning as a young adult. BLOOM: What advice would you give to parents of a child who can’t speak, especially if they have an intellectual disability? DJ Savarese: Visit my website at Listen2Us, and keep visiting it all summer as I finish it. Ask yourself how you can possibly know your child has an intellectual disability if you aren’t able to understand what they know. Try all kinds of communication with them: photographs, words, AAC, sign language. Read to them a lot and ask them questions using answer banks. New ideas keep us from getting locked in our old ones. BLOOM: Do you think we can learn from people who have intellectual disabilities? Is there value to all kinds of neurodiversity? DJ Savarese: There is value in every person, but I reject the term "intellectually disabled." It's a figment of the ableist's limited—and limiting—imagination. BLOOM: How does writing poetry help you deal with memories of your childhood abuse? DJ Savarese: It’s hard to put into words. It just does. If I can write a poem and strike a nerve in my reader, then I might still be sanely sad, but at least I’m safe and not alone. BLOOM: Who paints the images that accompany your poetry in the film? DJ Savarese: Em Cooper made the film awesome by offering an alternative to the camera’s outsider’s gawking stare. We collaborated online every week for months. Em Cooper is a British animation director specializing in combining oil-painted animation with live-action film. Her "striking, impressionistic animation" received critical acclaim across the British press in 2013 with the release of Kiss The Water (dir Eric Steel, BBC Scotland) for “gorgeous animation sequences in Munch-like swirls of colour” (The Observer/The Financial Times). In 2014-15 she created animation for Amazon Prime’s Emmy nominated children’s series Gortimer Gibbon’s Life on Normal Street. Em is a graduate of the Royal College of Art, Sundance Alumna and a winner of both the YCN Professional Award for Animation and the Gradiva Award for Film. And here is the two of us discussing our collaboration of poetry and oil-paint animation. BLOOM: Are you still studying creative writing at Oberlin College? DJ Savarese: I am no longer at Oberlin College, but I am still a writer. I graduated Phi Beta Kappa from Oberlin College in May 2017 with a double major in Anthropology and Creative Writing. An Autistic Self Advocacy Network (ASAN) Scholar Fellow, I was also the recipient of Oberlin’s William Battrick Poetry Fellowship and their Comfort Starr Award for meritorious scholarly work in Anthropology. My poems and prose have appeared in The Iowa Review, Seneca Review, Prospect, Disability Studies Quarterly, StoneCanoe, Wordgatherings.com, Voices for Diversity and Social Justice: A Literary Education Anthology, and A Doorknob for the Eye (Unrestricted Press). Links to my published work can be found on my website. BLOOM: What did you learn about yourself at college? DJ Savarese: I got an amazing education and stayed in my body for long periods of time. I can teach and I love to teach. I care what happens to our planet, and its story is in flux all the time. I assessed myself as able to write myself into a job, which I did. I’m an artist, but my words are not like yours. I’m interdependent, I’m not dependent; and people are safe if they’re interdependent. I assessed myself as smart and made it so. BLOOM: Something we see in the film is how exhausting it is for you to control your body to fit in with social norms. After you’d been at Oberlin for a while, did you ever feel like you could let your guard down and be freer with your movements? DJ Savarese: I loved Oberlin a lot, and, yes, once enough people knew who I was and told all of their friends and colleagues, I could move more freely around campus and the town. BLOOM: Is acceptance an important idea for disabled people—meaning acceptance of their differences and not always working to “fix” or “camouflage” them? DJ Savarese: I strive not only for acceptance but for appreciation and for need. I’m essential to the people in my life. BLOOM: You talk about being exposed to gawking strangers. How do you deal with that? DJ Savarese: I’m not as vulnerable to their stares as I was, but if I’m in my head, it can be sad to see myself in their eyes. I live down to their low expectations then. But if I’m in my body, I can ask my assistant to talk loudly about my accomplishments and introduce them [the strangers] to a new perspective. BLOOM: How many of your supports were covered financially by the government—or by Oberlin—and how many did your parents need to pay for privately? For example, I’m thinking of the assistant you had at night. DJ Savarese: I received assistance from Iowa VR for 58 hours of support assistance for homework and a partial tuition stipend and book stipend from Ohio VR, and Oberlin paid for my support assistant during class time. I also received 35 hours per week of personal care assistance. In exchange for my support from Vocational Rehabilitation (VR), I was required to apply for 3 scholarships annually, which I did and received extra assistance with tuition and room and board that way. While I was on the waiting list for the home-based waiver, I never actually made it above #500; in fact, my position on the waiting list worsened over time. BLOOM: You note that your mom lived in the town so she could help manage your support team. But you say that 'being included is every kids’ right, it shouldn’t be a lottery.' You obviously hit the jackpot when you were adopted by your loving parents. Did your dad teach disability studies before he adopted you? Or did he go into that after? DJ Savarese: My dad went into disability studies after he met me but before he adopted me. I think he was in graduate school for English when we first met. BLOOM: What was it like to watch the film for the first time? DJ Savarese: I’m not sure if I can say this; I’ve seen it a lot, so it’s hard to remember what it felt like to watch it for the first time. It’s not easy watching yourself on screen. I’m greeting fear most of the time. BLOOM: What do you hope to do when you graduate? DJ Savarese: As I mentioned above, I graduated in May 2017. I’m currently working full-time as an Open Society Foundations (OSF)/Human Rights Initiative Youth Fellow. I also just completed Harvard's Kennedy School course on Leadership, Organizing, and Action. I’m working to make literacy-based education, communication, and inclusive lives a reality for all nonspeaking people. I’ll likely get a PhD, but I’m taking time to see what life is like outside of academia, and it’s been a lot of fun so far. BLOOM: In high school in the film, you talked about writing a book. Are you working on one? DJ Savarese: I haven’t written a poetry book, but my chapbook, a small paperback book, is A Doorknob for the Eye. I’ve written my honours theses for Creative Writing and for Anthropology, but neither of them has been published. At some point I hope to publish a lot more. My website has links to most of my published work thus far. I hope to get more writing done this summer, when I take a break from travelling with the film for a while. I love writing, but it’s difficult to fit it in with two full-time jobs. BLOOM: Can people follow you on social media? Before you hit share, did you ask your kid?